How Many eBook Readers Do You Own? I saw this topic mentioned over at MobileRead and it’s an interesting question. How many ebook readers do you own? 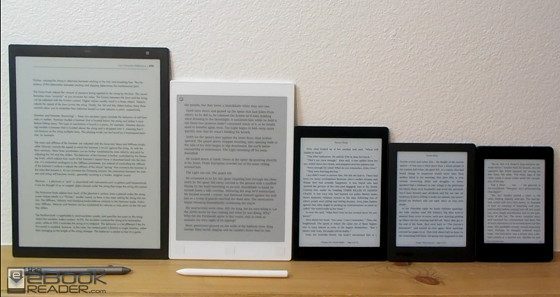 Are they all the same brand or do you own multiple types of ereaders? It seems like lots of people have more than one. It’s not uncommon for someone to own more than one Kindle; lots of people have upgraded to newer models over the years and still have an older one laying around. Amazon’s Kindle trade-in program is a good way to get rid of older Kindles and to save some cash when buying a new one, but some would rather keep their old Kindle for a backup or give it away. Personally I usually have at least two ereaders in use at once. Lately I’ve been switching back and forth between the Kindle Oasis 2 and the Kobo Aura One for reading ebooks, although the Kindle has been getting the most action lately, and the Onyx N96 gets put to use for PDFs. I have several other models in the closet but they don’t get used very often anymore. At one point I had like 20 from doing so many reviews but I had to start getting rid of them because I don’t like having ereaders that I don’t use given the fact that their batteries wear out over time. It’s nice having different brands to choose from. You can use a Kobo for Kobo books and a Kindle for Kindle books without having to mess with downloading every book you buy, removing the DRM, and converting it to other formats. Owning multiple ereaders isn’t a practical solution for everyone, but it’s a nice option to have if you read a lot, especially if you don’t want to settle on using one main source for ebooks. So how many E Ink ereaders do you own? If you have more than one, how many do you use regularly? Honestly you only need one. Everything else is a distraction and clutter. As they say the things you own end up owning you and the constant comparison and switching devices is enough to make you go crazy and prevents you from making any reading progress and prevents you from being locked in and getting lost in a story; it kills continuity. I also fell into the trap of purchasing every eReader that came out. I had virtually every Kindle and every Kobo until finally realizing that there isn’t a perfect eReader. Sure I love Kobo for the customization and flexibility not to mention larger size but the fact is that it’s not as smooth and polished as a Kindle and I’m not able to send notes and annotations to my PC directly or by email which is a major flaw and had me break ties with Kobo for the time being. Not to mention Kobo device covers are garbage IMO. As for Kindle, I’ve tried them all including in the laster Oasis which I thought was a MAJOR disappointment so I returned it and truthfully I am sticking to a simple Paperwhite because I like the screen feel and especially the Onyx book cover. Kindle in my opinion is nowhere near as good as Kobo regarding screen quality but it just works and the highlighting is clean and not frustrating like Kobo. Not to mention the cloud and store is second to none. It’s reliable and the compact size makes it easy to grab and go. Having multiple eReaders only gets in the way. I speak from my own experience of course but I’m sure others would agree to a certain extent. It’s a matter of just finally saying to yourself there’s no perfect device and just stick with what works for you. I have 3 in use right now: Kobo Aura One, Nook Glowlight 3, and Kindle Oasis 2. I’m reading stories saved to Pocket on the Kobo, a book on the Nook, and a short fiction magazine subscription that gets sent to my Kindle. My husband has more than one too. And we still have some older ones tucked away. ATried Paperwhite, the Voyage and the Oasis but returned them. I have kept just one: Kindle 3G with keyboard (aka: K3). The key selling point for me is page turn buttons. I have a few Kindles …Oasis Voyage and a Paperwhite…After getting the latest Oasis I am exclusively using it…no longer looking for the next big thing. It’s probably going to take a color e-reader to even consider a new e-reader. Here Nook Simple Touch, Kobo H2O (1st gen), Kobo Aura One. When talking about the Kobo, is there a front or side light which I read was better for the eyes? I’d like something that is front lite and you could use Google and is comfortable like the nook with rubberizedback. There is no evidence that it’s better for your eyes, but some people feel more comfortable having the option to change the color to a warmer tone at night. Most of Kobo’s ereaders have the frontlight color control expect the Kobo Aura. David, if you’re asking about front-lit versus back-lit, all ereaders are front-lit. I have my Voyage. I did try the new Oasis but after two units that I felt had screen issues, I decided to quit the “screen game” and stick with my Voyage. I have one dedicated e-reader plus other tablets that I could use if I had to, but I’d rather read on the Voyage so that I’m not distracted. Functioning e-readers: 3 – Aura One 32GB, Oasis2, PaperWhite3. There’s also a Nook Glow last gen around here somewhere that is too pathetic to even gift. Haven’t seen it in well-over a year and I hope to never see it again. Non-functioning: 3: Aura One 8GB, Voyage, Inkbook. The more that I’ve used the Oasis2, the more that I’ve grown to hate it and it’ll soon get shipped off to a newphew; I’ll keep the PW3 as a backup. I absolutely *love* the new Aura One 32GB. Noticeably faster, better battery life and better screen than the original which was pretty great itself. Not sure why any of those things are true but It’s the only one I use now. I have an old Sony PRS-505 that still works, but I don’t use it anymore because the contrast between the font and the background is too low (my eyes aren’t what they used to be). I also have a 1st Gen Nook that doesn’t work (the light up navigation bar doesn’t light up and some books refuse to open). I don’t want to get rid of it until I can find some way to do a factory reset to keep anyone who finds it out of my account (I mostly read in apps on my tablet and phone now, so I don’t want to close my Nook account and lose access to those books). Just recently got rid of my Paperwhite 3 and first gen Oasis (traded them in to Amazon). Never used them anymore since getting the Oasis 2. My wife also has a Paperwhite 3, but she doesn’t use it all that much and didn’t want my Oasis 1, so I figured I’d trade them in rather than have them sit around gathering dust. I am currently using a Kindle DX and a Kindle Touch. My Kobo Aura HD had been my default e-reader fir years, but the battery is dead and I haven’t replaced it yet. In being forced to use the Kindle Touch after the dead battery, I have discovered a workaround for what annoyed me the most about MOBI- the lack of traditional pages. In Calibre, convert an EPUB doc to AZW3, and pages appear. Though in at least one case, the initial conversion didn’t work. Fortunately, the second conversion worked. I use the Kindle DX for PDFs. Some of the PDFs have thin fonts that I find difficult to read. I found a workaround. Convert the PDF to TXT (no, that doesn’t always work). Then convert TXT to DOC. Choose appropriate font type and size, and convert to PDF. I find that MS does a better job of converting to PDF than Calibre, which explains the DOC step. I got a very good price for a Fire HD 8 (6th generation). As none of the updates, including one this week, have included any boldface fonts, I don’t use it. Maybe I will use it for audio books. I have a first generation Nook which I bought used, but the screen has messed up, so it will go to Goodwill. Own but no longer use: Kindle Fire,Nook Simple Touch, Nook Tablet. Guess I should sell them or give them away. You can unpack PDF with this free tool called Mobipocket creator. Just save as html, import into calibre and then convert to .mobi or whatever works for you. You get a fully functional mobi. I have several Kindles, a few Kobos and a Nook Glowlight Plus. I use the Kobos and the Kindles but I don’t use the Nook much. Having all these has nothing to do with common sense. I just like having them. It also has nothing to do with removing DRM. I do that to make safe backups of every book I buy. I buy my books from Amazon and read them on all my devices. Including tablets, l have seven devices I use as readers. They range in size from my original Sony PRS-350 to an iPad Air 2. I like having multiple readers as I usually have mote than one book in progress. With the exception of comics and graphic novels, I favor the smaller, lighter devices. I have what I call “tablet thumb,” a left hand thumb that becomes very painful from holding a device too long. The two I use most often are my PaperWhite and my Fire 7. I have books in Sony EPub, Kindle and iBook format but the majority of my books are in Kindle format. Using only one source keeps me from buying the same book twice. I have five, three Nooks and two Kindles. The Kindle Voyage is getting all the use these days (minus reading on my phone and tablet, which I do occasionally). . . If the original Nook Color battery had held out, that might well still be my primary reader. I liked the file management and user experience of that one best, by far, and I loved the SD card slot. It won’t hold a charge as well anymore, though, and I like the Voyage well enough that I’m not clamoring to try to change the battery in the Nook. If I had money I wanted to devote to devices rather than books, I’d love to try other brands, but it’s just not a priority at the moment. I have 2 6inch readers: Boyue t62, and kindle paperwhite. Both are good, not perfect. And I am working for to get some money for to buy for gift me a 8″ boyue likebook or 9,7″ onix boox, 13,3″ may be impossible. Cause I have a lot of books in PDF for study health, and I am try to converter my physical books into PDF, scanning page to page, but sometimes is bored, and quality isn’t good. Not all are in digital. And I don’t have a big place for to get. I have to select. I currently have 5 kindles. 2 kindle keywords, a Kindle Paperwhite, the Oasis 1 and the Oasis 2. I’ve been trying out the oasis 2 but will be returning it. Don’t like the cold metal feel. I love the first generation oasis for reading in bed because it’s so light without the case. Makes it perfect for holding while reading in bed even as I get sleepy I travel with my kindle paperwhite and use my kindle keyboard for outdoor reading by the pool. Although it’s the oldest I still find the Kindle keyboard to be an amazing E-reader. All that being said I have to agree with Rick… Having all these kindles are a distraction. I saw myself in his comments. If the Kindle paperwhite had the weight and physical page turn buttons of the first generation oasis it would be perfect. I did try the Kindle voyage but the tactic page turn buttons weren’t for me. When recommending a Kindle to my family and friends… It’s the Kindle paperwhite that I recommend. I do think it’s the best E-reader for most people. Kobo Aura One, Kobo Glo HD and Tolino Vision 4 HD. Just sold my Voyage, planning to get Oasis 2. I’m using mostly Aura One for the size, but Tolino is a very close second – a really solid reader. My Glo HD is for back up and my occasional travels. I have 3 Kindle Fires and just bought another one that is not yet in use. I have never tried another brand but I wish I could find one that works well in sunlight. Anyone? I love the Fire because it’s like a complete computer in my hands. I use the newest one and have given away my older ones to my husband, my daughter, etc. My first one, a gift in 2012, is being used by my husband and still works well although lost it’s sound 3 years ago. Oh, my gosh. My wife and each of my three children have their own Kindle. Two are paperwhites and two are Fire’s. I personally own four working Kindles – three keyboards (because I like them and I want to make sure I have one when another dies) and a paperwhite. I review books and e-copies are sent directly to one of my Kindle keyboards, so I know everything on there is meant for review. My Paperwhite is books that I purchase or want to take with me on vacation (or to read at night in bed). I would think about another brand e-reader – I’ve come close to picking up a used Nook just to have it – but since the various Kindles work well enough for my needs I haven’t seen any reason to get anything else. 4 e-readers. Kobo Aura One used all the time. 1st Kobo H2O some days seems to be best screen and used as backup of books on SD card ,Sony PRT-T3 with rear light cover and Sony 505 which I got for £5. Sold/swopped 3 others in the past. Without a doubt the original Kobo H2O has the best screen. Nothing compares, not the Aura One, not the Voyage, nor the new Oasis 2 and the H2O edition 2 was a step down. The Glo HD comes very close but still the original H2O is king. Ive had them all and i still use the H2O from time to time but its a bit on the heavy bulky side unfortunately. I also own one Sony PRS-505. Never boot it up since I got my first kindle in 2009. I still own my first and only Kindle Paperwhite. As per reviews of more recent Kindles I think it’s the best both in quality for reading and price/performance. The only original drawback has been improving in time and is that there was not much literature in languages other than English. I don’t have our use other ereaders. I would only like to find a good quality reader for epub format publications not available on Kindle. In total, I’ve only ever had two readers (the number of tablets I’ve owned is an entirely different story) the Kindle with like three buttons and the 2015 Paperwhite. I absolutely love my Paperwhite. I don’t use it much anymore, unfortunately. I use my Samsung tablet since I’m able to read from more than one reading app but i do occassionally switch back to the Paperwhite, especially when I’m out an about (I prefer to leave my expensive tablet at home). I do plan on upgrading an e reader if it’s worth it, the new Oasis, I feel is not, because i do love the Kindle store but as of now, I am more than satisfied with my Paperwhite as its intended purpose is to be able to download books and read on the spot and it does so wonderfully. How many ebooks do you have that you’ve read and how many you haven’t? How many you gotten for free and how many you paid for? I only have the Kindle 3 I bought. I love the keyboard but would like an even light, this has no light. The nook 3 looks so comfortable to hold but the one with a light is backlit bad for eyes. I read on the Kobo Auro One almost exclusively, but also have Kobo Aura H2O, Kobo Glo HD, Kobo Glo, Kobo Touch, and Kindle Paperwhite 2. I purchased a Paperwhite 3, Voyage 1 and Oasis 1, but the lighting was terrible on all of them and I returned them. I also prefer the Kobos because you can set the page turn zones to use the bottom of the page to turn forward instead of just the right side; also the Kindle has a separate touch zone on the bottom for choosing the progress display, which doesn’t work with how I hold the ereader. Using 2 interchangeably: Kobo Aura One and Kindle Voyage, love those flat screens! 1 Sony PRS something in red aluminum — cutest! When I fell in love with e-readers, I fell hard ;p Still love them and only buy cookbooks or reference books in paper and from used bookstores! > 1 Sony PRS something in red aluminum — cutest! Jupp, and also the one with the best PDF reader, also rooted mine. And with a Black Friday 20% off deal I bought a Tolino epos, as I liked the hardware feel in my hand (no cold aluminium for me). Software is lacking (PDF is the worst, not even landscape mode). That it is waterproof is an added bonus. Oh, and the USB-Port is the wrong way up. One thing most, if not all reader get wrong: why or why not a little border around the USB-Port in a different color or shade, so you can find it more easily in the dark? And the Tolino has no led indicator for charging / end-of charging. Otherwise I consider the hardware the best yet. Although without an OSASIS 2 to compare my guess is, that could be faster?! The Tolino has a few different options for reading, like you can add fonts and use them. But it lacks a few options of the software and infrastructure I use on the Kindle, like “send to kindle-email”, a great use with Calibre to send news-webpages to the device without a lot of work. My main gripe woh the Tolino. is that with the bigger Display comics as PDF are still slow and I have no Comics (yet) in EPUB format. On the Kindle in comparison, they have done a good job with the Kindle-Comics, panel-view, and on the Voyage reasonably fast, that could have been a reason for buying a Oasis 2. I started with a Nook Simple Touch, and as I was enjoyed with it, I bought another one for my wife. Later I acquired a Kobo H20 (1st generation). I Have 16 e-readers: 5 kindles, 5 kobos, 2 Nooks, 1 Sony, 1 boyue, 1 onyx boox, 1 Cybook: Kindle 4, KT1, kt3, KPW1, kPW2, Kobo Aura, Kobo aura hd, kobo Aura H2O, Kobo glo, kobo glo HD, NG1, NG2, sony prs T2, Boyue T62, Onyx Boox c67 carta2, Cybook muse HD. 1 2012 fire, wife prefers as reader. 1 zinger – 3.5 inch phone is a surprisingly good ereader, very small, fits in hand nicely, paging done with oversized volume buttons that rest under fingers. .
More than one can be rationally had for different purposes. For example, a small one for bedtime fiction, a bigger one for research at the desk. I have a small (6″ screen) one for on-the-move reading and a big (8″ screen) one for indoors. A shared microSD card keeps them in sync. I own two because more than 50% of my digital content is Amazon mobi. I find it easier to have a Kindle e-reader to read my Amazon content (saves me from having to do any conversions), and the Sony e-reader for all my e-pub and Kobo e-pub content. So that $49 (on sale) purchase of the basic Kindle was really great from a book management standpoint — just saves me from having to do any Amazon content conversions. At some point I’d like to also have a larger e-ink based e-reader to make the reading of PDFs easier. Small typo – I meant 20% of my content is Public Domain (i.e. from Gutenberg, etc…) not 30%. I had/have a Nook STR rooted and still alive I think, although the antislip coating is all sticky. I also have a current Kobo Aura ONE, and a Samsung Tab S2 for comics. both rooted and anroidified; stacked with a host of apps and OTG gadgets. They’ve been my productivity machines for reading, surfing, writing and even navigation & media for a couple of years. Now they start getting close to retirement age, with an Acer Win10 2in1 and the cellphone taking over. They both still work great, batteries hold well and the old 2.1 Éclair is still nicely chugging along. And since none of the Android readers yet come close to the NST’s performance, I will wait a while to get a new one. I own 3 eReaders but gifted a lot to family members. I also own two Fire tablet. A 7 inches (only to read PDF) and a 8 inches HD. I gifted : Kindle (2013), Kindle (2017), Fire 7 inch, etc. i have 3. the glowlight plus is solely used to do anki reviews for my language learning. in addition I wish i did not sell my Oasis 1 and Voyage but oh well. I get bored and like to switch devices. My first was a Bebook-branded Hanlin V3+, the loss of which during a trip I still mourn. I have yet to find an adequate replacement, but I currently use a Pocketbook Inkpad 2 at home and for travel purposes, I am migrating from a Letto-branded Cybook Muse Frontlight to my most recent purchase, a Tolino Vision 4 HD. I also own a Onyx Boox M92, for displaying PDF/comics, and a Yotaphone 2 that I tried to use as a phone – unfortunately, the internal microphone proved unusable. I have owned and given away an iRiver Story HD, a Denver EBO-610L and an Energy Sistem Screenlight HD. And probably one or two I have forgotten about, putting me at a total of 9+ ever owned, of which 5 are still in my possession. I will probably never own a Kindle, unless someone gives me one, and have only recently started exploring buttonless models. I’m currently looking (hard) at the Cybook Muse HD and the Kobo Aura H2O 2, since I’m not convinced the Tolino is measuring up to the pedestal on which I’ve placed my lost Hanlin. Addendum: Went with the Pocketbook Touch HD 2 rather than the Muse or Aura. It feels quite nice to hold, the positioning of the buttons works better than I imagined. Highly recommended. Meanwhile, the protective cover/case of the Tolino has started cracking and losing shards, leaving sharp edges around the corners where I tend to hold it. Current interest: Onyx Boox Max 2, as an upgrade from my M92.